G’Day Casino has always been one of our go-to sites for a great variety of real money blackjack games, but the addition of their new live dealer suite has really stepped things up a notch. Now along with roulette, baccarat, keno and lottery, there are several sophisticated live dealer 21 games that can be enjoyed on both desktop and mobile, making G’Day Casino a new front runner for live dealer blackjack. The new live dealer games at www.GDayCasino.com are powered by Net Entertainment, the same software developer who brought us such fabulous online 21 variations as Double Exposure Blackjack, Blackjack Pro, Pontoon Pro and Single Deck Blackjack. 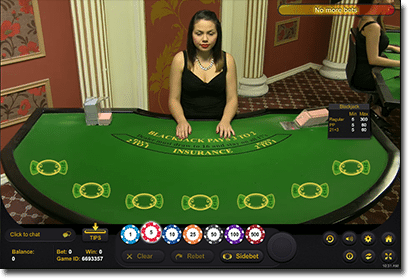 NetEnt’s live casino games are some of the highest quality live blackjack games we’ve seen so far, with games hosted by friendly, attractive croupiers from high-class casino studios that perfectly capture the atmosphere of gambling at a real life blackjack table. Live blackjack – using classic blackjack rules, NetEnt’s live blackjack game is beautifully presented and comes with multiple features like a player chat option and the Dynamic Billboard which allows you to view the dealer’s last 10 hands. Live VIP blackjack – this one’s for the high rollers, streaming from an exquisitely elegant studio with games hosted by stunning croupiers. If you miss the special treatment of playing in exclusive VIP lounges at land based casinos, NetEnt’s live VIP blackjack will scratch that itch. Live common draw blackjack – this advanced 21 variant allows many more players to join in (rather than the seven usually limited to live dealer games) so you don’t have to wait for a space at the table. Common draw games are fast paced, with all players playing with the same common hand of cards as dealt by the croupier. Another stand out feature of G’day Casinos live dealer platform is that unlike other online casinos which require players to have a real money account before they can access live games, at G’day players can try these live games out for free in demo mode. This is a great new offering as many punters aren’t sure if live dealer gaming is for them, so this allows you try the games out with no risk to your cash flow. If you’ve never tried live dealer blackjack before, these games are streamed in real HD video over live video streams from casino studios set up to replicate brick and mortar venues. Games are hosted by professionally trained, courteous croupiers and you get to place your bets and watch the action unfold in real time. Live dealer games are ideal for those who are way about random number generated (RNG) blackjack games or for those who miss the action of gambling in real life but still want to enjoy the comfort of playing from home. If you haven’t had the pleasure of playing at G’Day Casino before, follow our links to register for a new account and get some of the best welcome bonuses available on the Internet. G’Day offers new players a 100% unlimited matched deposit bonus when depositing funds to play with for the first time, along with 50 free spins on the popular online pokies game South Park Reel Chaos. You’ll also receive a free slab of beer delivered to your door, so you can kick back and enjoy a relaxing brew while sampling this incredible new live dealer blackjack games.